1. First make the ponzu sauce.Combine all of the ingredients for the ponzu sauce in a small saucepan, bring to the boil and remove from the heat. Set aside to cool. 2. For the tataki sauce, mix together all of the tataki sauce ingredients in a bowl and put to one side. Keep the sauce at room temperature. 3. Place a non-stick pan over a high heat for 5 minutes or until very hot. Place the tuna on a clean board or plate and season generously with freshly ground black pepper and salt. 4. Pour the vegetable oil carefully into the hot pan then add the tuna. Sear the tuna for 12 seconds on each side being careful not to over cook. Transfer the cooked tuna onto a clean board to rest. 5. Serve the tuna finely sliced at a 45° angle being sure to cut against the grain and place onto your serving plate. 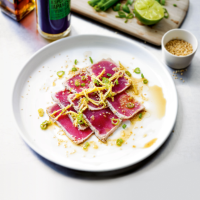 Garnish the tuna with the tataki sauce and serve. This recipe was first published in Thu Jun 23 12:34:00 BST 2016.